Projector is a display device that has became an absolute necessity in a modern classroom. Globus Infocom's new Ultra Series projectors promises superior quality along with a commendable performance. The various important luxury features related to this series make projectors a class apart from the rest. Portability, real and true color images with greater contrast and purity, crisp picture quality, high brightness and an unique design are some of the highlights of this series. With Ultra series projector by Globus you would surely win great applauds for an impressive and complete presentation which would mesmerize your audience to the greatest level. 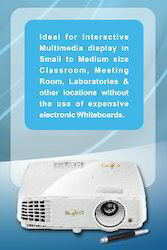 Our Smart Classroom Products – Multimedia Projectors is finally on DGS&D Rate Contract.